Event Description: An exciting place for a corporate teambuilding event, Denver’s LoDo (Lower Downtown) district is breath taking (literally!). 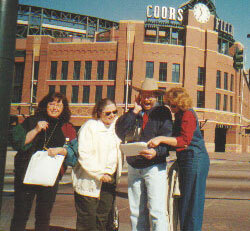 Just a heartbeat from stylishly retro Coors field (home of the Colorado Rockies), your LoDo treasure hunt is a walk through time to the late 19th Century, when a maze of factories, warehouses, hotels and saloons gathered around regal Union Station-the hub of train travel in the Rocky Mountains. Today, LoDo still has its stone and brick warehouse buildings, with their faded but atmospheric advertisements of a bygone era, but you’re more likely to stumble into a microbrewery, upscale restaurant, or refurbished loft than a factory or flophouse. During your corporate team building treasure hunt…expect to hop from diamond to diamond at the Market St. bus station; elevate to the top of a parking lot for a spectacular mountain view; play ball at a miniature baseball diamond in brick. It’s team development at high altitude with the Doctah.